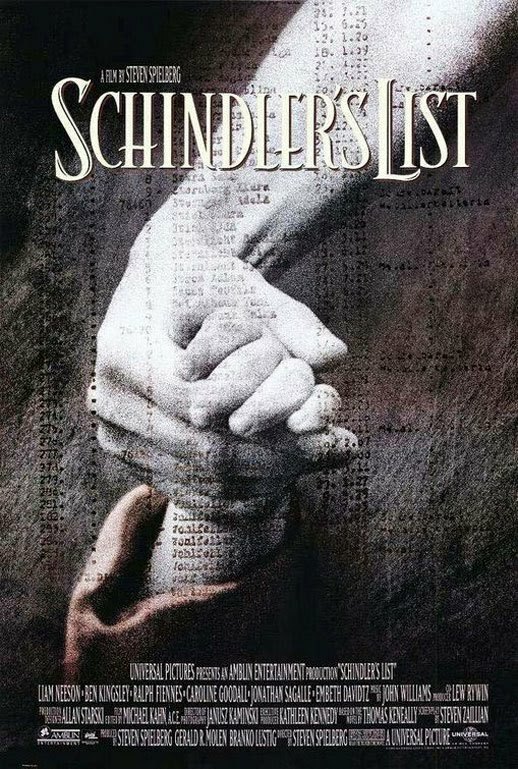 Infinite Art Tournament: The Great Movies: "Schindler's List"
In the three years now that I've been working on the Great Movie project, I’ve often wondered what I was going to do about Schindler’s List. It is a film that I recognize as “great,” or at least as having a lot of merit, but watching it again is not an experience I especially care to subject myself to. My strongest memory of watching it the first time, in the theater, is of leaving for the restroom halfway in – not because I needed to pee but because I needed a break from the horror. There, I discovered my roommate, doing the same thing. He eventually headed back for the second half, and I followed him out a few minutes later. Well, I can’t blame Spielberg for trying, and I certainly recall his movie being a powerful document. He certainly is to be commended for looking the Holocaust full in the face, as Roberto Benigni would so memorably fail to do in his allegedly uplifting, highly popular, and unspeakably vile Life is Beautiful a few years later. The only problem is this: I’m trying to live a happy life here, and being interested in history already gives me more than enough challenges in pulling that off. Wallowing in some of the very worst moments of recent history is just asking for trouble. Being responsibly knowledgeable about the more hideous examples of what they used to call “man’s inhumanity to man” will have to do. For Schindler’s List, once is enough. Plot: German industrialist attempts to balance his survival and his new-found humanity in the terror state of the Third Reich, trying to maximize the number of people he can keep from being sent to death camps. Dialog: I remember being impressed by the way that the characters’ choices of words and phrasing was used to illustrate aspects of their personalities. Prognosis: Everyone should probably consider watching Schindler’s List once. You might be interested in checking out the book and reading how it came to be written. It helps to balance things a bit. Oskar...now, was he actually German, or was he something like Czech? Not that it matters a great deal, just that there were a lot of nationalities swirling around in the cauldron. That is wimping out, Mr. Michael. I remember seeing this with a friend and we both left the theater together and started bawling. It was powerful. And the little girl highlighted in red really resonated with me becuase my dad told me that when he watched it, it made him cry and made it "real" and "personal" because when I was a little girl, I always wanted to wear red shoes and this visual made the little girl "real" for him. And the music ... I bought the soundtrack just for that violin piece. Haunting.